NTSC, Code 0, approx. 180 Min. Deke Dickerson, one of the most respected guitarists on the West Coast Roots rock scene, combines first-class sounds with an encyclopedic knowledge of vintage country, rockabilly, surf, blues and garage rock, all characterized by his typical sense of humor. Dickerson was born in the summer of 1968 in Columbia, Missouri. Raised in a peasant family, Dickerson grew up with classical country sounds and once told a reporter that the first two concerts he saw were by bluegrass pioneer Bill Monroe and blues icon Willie Dixon. Dickerson started playing in bands at the age of 13 and was an experienced veteran when he founded Untamed Youth in 1987. The mixture of surfing and garage rock gave the band a small but very loyal cult, but despite the move to the west coast the band gave up in 1993 after six years of struggle, just before the success of the pulp fiction soundtrack breathed new life into the surf scene. 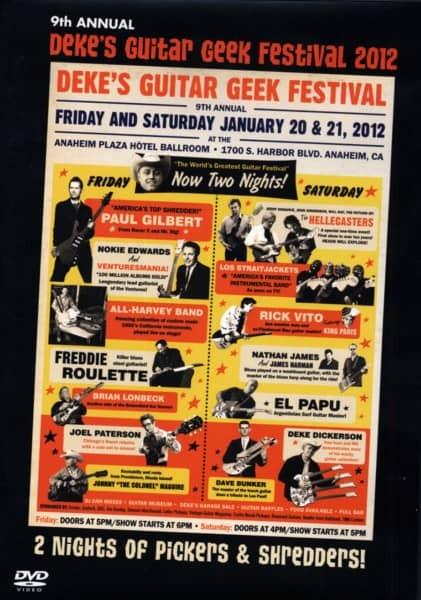 Customer evaluation for "Deke's Guitar Geek Festival 2012 (0)"